In a jab at the GOP candidate, Sita Bhaumik will invite gallery attendees to tear down the wall at Southern Exposure Gallery. Sarah Burke Sita Bhaumik (L) with Victor Martínez. Sarah Burke Sita Bhaumik (L) and Victor Martînez. At Piñatas las Morenitas Martínez in Fruitvale last week, a Teenage Mutant Ninja Turtle hung next to a pair of princesses wearing intricately hand-painted dresses. Behind them was a pile of less festive piñatas: grey cinder blocks, stacked into a makeshift wall. Soon, Oakland artist Sita Bhaumik arrived to pick up a batch of blocks and take it to Southern Exposure gallery, where she's building a show called Estamos contra el muro | We are Against the Wall. The focal point of the installation? A grey divide made of three hundred piñata cinderblocks stretching the length of the gallery — a mockery of Donald Trump's proposed border wall — which will be pummeled during a community celebration at the end of the show's run. Out front, Victor Martínez was constructing a traditional seven-pointed piñata by attaching cones of card stock to a paper ball, covering the surface in papier-maché, and attaching streamers that he had cut fringes into by hand. Bhaumik explained that traditional piñatas, like the one Martínez was making, are meant to symbolize the seven deadly sins, and are historically broken in church to cleanse oneself of evil. That's one reason she thinks it's a perfect medium for creating a mockup of a Mexico-U.S. border wall. "One, the piñata exists to be destroyed. And, two, it represents evil," Bhaumik said. "I think this wall absolutely represents evil. "What more perfect way than to use a piñata as a form for something I don't think should exist in the first place?" Bhaumik, who is of Japanese, Colombian, and Indian descent, typically makes art that focuses on food and the relationship between recipes, heritage, and migration. She's one-third of Oakland's People's Kitchen Collective, which aims to bring folks together by putting on community meals, such as the Free Breakfast Program (in the vein of the Black Panthers), and events like Diaspora Dinners. As a solo artist, Bhaumik creates ephemeral and often site-specific installations that use scent and spices such as curry powder to spur conversations about race. But for her Southern Exposure show, which will run from September 9 through October 15, she said she had to respond to Trump's audacity. "Yes, it's a totally ridiculous wall, but also Trump is a ridiculous person, and this election has been completely ridiculous," Bhaumik said. "This is a ridiculous project because his proposal is ridiculous." 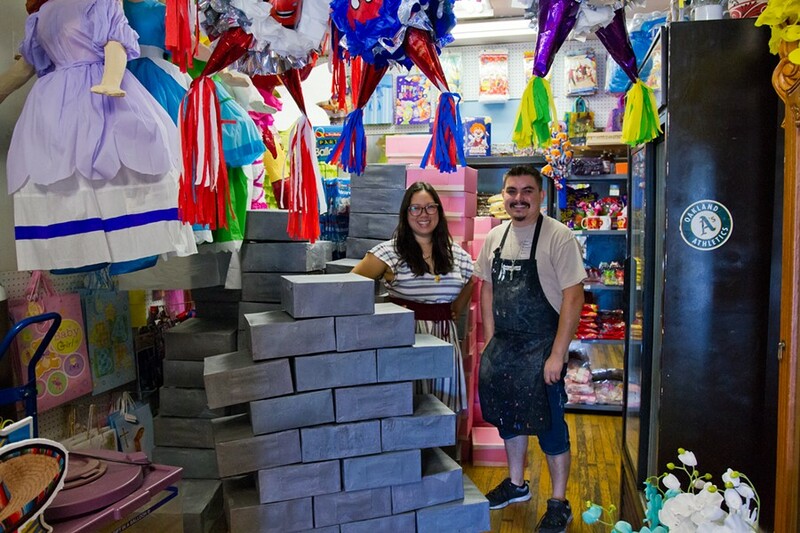 The installation will also include a to-scale model of a portion of the wall, created out of miniature piñatas made by Little Piñata Maker, a Bay Area artisan that sells piñatas approximately the size of key chains. A tiny Trump figure will look up at the model, emphasizing the wall's towering height. Although the show began as a solo, Bhaumik has folded in collaborators at every opportunity. The diasporic DJ collective La Palenga, based in Oakland, created a "Migration Mixtape" that will play in the gallery throughout the exhibition and is also available for purchase. And halfway through the exhibition's run, Cece Carpio of Trust Your Struggle art collective will deface the wall with graffiti. For the closing reception and "Community Demolition Party" on October 15, the other members of People's Kitchen Collective will join-in to narrate the demolition of the wall. Attendees will take turns having a swing at it — and scooping up the goodies inside. Meanwhile, Bhaumik and chef Norma Listman will be serving up guajolotas, a hardy Mexican meal typically eaten at the start of a long work day, which Bhaumik said in this case will be to fuel the figurative border crossing — or smashing. "When you think about a wall, it's supposed to be static and it's supposed to create this impermeable barrier, but I think we all know that people find openings and find opportunities and find ways," said Bhaumik. "What it's already doing as an idea is trying to split communities apart, and we're trying to do the opposite in hopefully bringing folks together." Halfway through the show, on September 22, there will be a public dialogue with artists and organizers about creative strategies for addressing migration, economics, and U.S. border politics, called "Strategies Against the Wall." But Bhaumik also intends for the installation to speak more broadly to border politics around the world. "The fact that there's an election and there's all this wall rhetoric makes it really associated with this particular U.S.-Mexico border, but I think for me it's also about imagined walls," Bhaumik said. "There aren't the same kind of walls when you're talking about the thousands of migrants that are leaving Africa into Europe right now, but there are very real life and death borders even if there aren't physical walls."